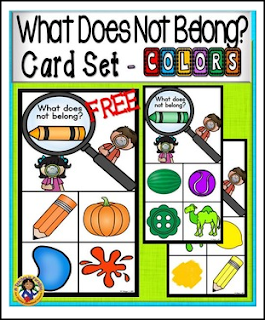 Here is a great opportunity for your young learners to practice color skills, visual discrimination, and classification with this set of 11 cards. Included in the set are 11 cards - one card for 11 different colors. Children will look at the cards and identify the one that doesn't belong in the group. Each card features four pictures; one picture on the card is different from the other colors. Children will choose the picture that does not belong. The cards can be used with manipulatives such as flat marbles, counters, cubes, or clothespins. 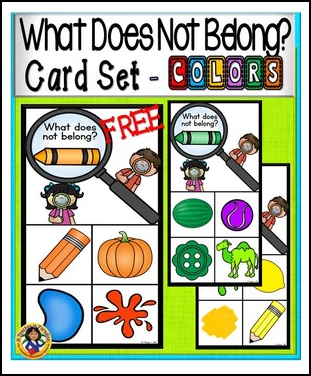 These activities can be used in small groups, centers or independently. This set is part of a bundle that includes Shapes, ABCs and Numbers.